The HM Digital SM-1 Inline Single TDS Monitor accurately measures the TDS level in your purified (product) water. It enables you to determine just how good or bad your water really is! Use the meter to determine when the reverse osmosis membrane needs replacing. Displays TDS levels of a single water line. 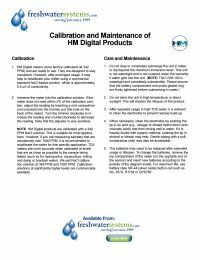 Factory calibrated -- HM Digital meters are calibrated with a 342 ppm NaCl solution. Meters can be recalibrated with a mini-screwdriver.